After staring and fiddling and more staring and fiddling I gave myself a good talking to. If I can't decide what is the best move, then I just need to pick something and then do my best to make it work, so that's what I've done. In the end I have gone with plan B, which was to use the three smallest lighthouses together in what will probably be the top row. They look like this now. I think this project has sparked some of the most interesting, thought-provoking comments I've had since I started to blog (so a huge thank you to everyone who has taken the time to share your views). Several people have suggested that I could do something interesting with the setting for these - for instance using them all laid out horizontally, like a landscape, or finishing them in sets of 3 so that they could be hung in different combinations. Now, I've banged on a lot about my preference for quilts that are big enough to be functional, but in this case this sort of approach seems like it could be very effective and I am drawn to try it out. There is, though a practical difficulty, which is that these pieces are pretty big (the strip in the picture is about 70" across) and I certainly don't have walls big enough to take them. So this will be a functional quilt, but I am going to start again, making slightly smaller blocks, specifically with the idea of trying out a wall piece. But let's get this one done first. Thanks for sharing the process, I'm enjoying your thinking and decisions, the design challenge! I really like the color progression across these blocks, and I love how this project is definitely speaking to you and going to continue to morph and grow into something new. That looks right. Keep at it. These three look perfect Kaja and would make a beautiful art quilt that way. But I can see why three of them at 70" wide would be difficult to place. They will be great all together as a functional quilt. Have you considered entering this in a show? It would stop everyone in their tracks! These three blocks do work well together and all for entering it in a show as Lara suggests. I tend to prefer functional quilts myself. I think since you have a series of them already made you have the choice of either option. Both are good choices. There are moments when I think we've put so much into the work mentally, emotionally, and physically, too, that we need it to be one or the other. You'll know. Glad you are keeping it functional! I like what you've decided upon so far. Its a journey isn't it, then when its right, you finally see it ..voila! Very pretty. 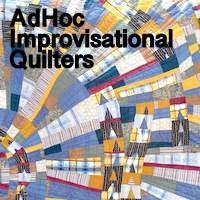 I like them as one quilt, but having smaller wall hangings sounds like a really neat idea as well. Glad you're having so much fun that making more is an option!